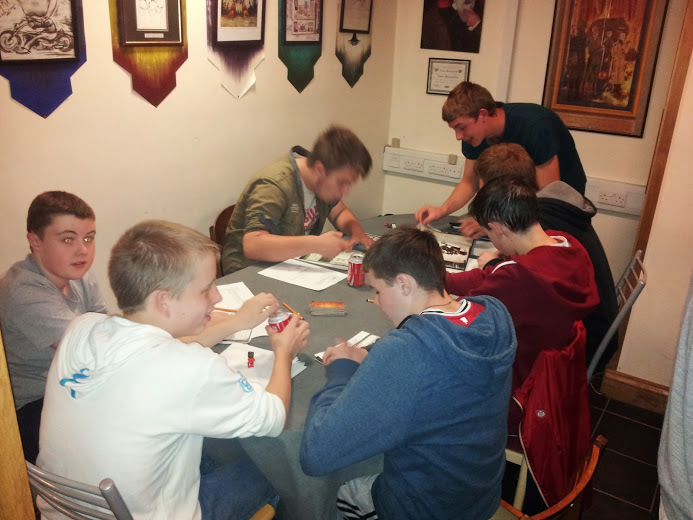 A Role Playing Game (or RPG for short) is a game played with some friends, dice, paper, pencils and imagination! You get a character, who is represented on a sheet of paper with various numbers to define how strong/intelligent/etc that character is, and then you take on that persona for the course of an adventure. Role Playing is easy to get the hang of, but challenging to master, and can be a life-long hobby, or even career for the lucky few! Ultimately, to boil role-playing down to its' essence, it's improvisational acting - you are pretending to be a character who has no script, except what you come up with yourself, so your character's level of involvement in the events transpiring around him/her is entirely dependent on you! You can play a Vampire, a Wizard, a Mighty Warrior, or even an X-Man or Avenger, it all depends on the game, the system, and you. Please feel free to come to the main desk and ask for Jon or Dee, and we can take you through role-playing in more detail if you're interested. Roleplaying has pre-dated Conclave in Limerick for nigh on 2,000 years. Through the mighty days of the 80's to the RPG collapse of the 90's, Conclave has continued to sustain this avid genre of games over the decades. RPGs recently have seen a huge resurgence with the likes of D&D 5th Edition leading the charge. If you have never tried roleplaying games before or maybe you have in the privacy of your own home, well maybe now is the time to go public and give one a try in a corporate box in Thomond Park. Fun for people of all ages food for the imagination. This entry fee includes ANY & ALL RPGs i.e. how many can you play in one weekend!